1. Can you work from the other end of the problem rivet? 2. Keep in mind that rivets usually expand when they are hammered in. It's quite easy to damage the wood when you try to pull them out. Consequently, I usually try to end up with a drill bit as close to the diameter of the rivet as possible and drill all the way through. Only removing the head and then trying to pound the shaft out doesn't work well in most cases. 3. Another source for rivets is: Jay-Cee Sales & Rivet, inc., Farmington, MI 1-800-521-6777. They also sell the hand held rivet tools necessary to pound a nice, even head on the rivets. 4. Not all Klepper clips are the same in size and even in distance between rivets. 1. Both sides are equally mangled on the rivet with two drill bits in it... What a mess. But, I think I can drill another hole down one of the sides. I've removed the clip which was probably a mistake as now it's just the rivet and wood. With the clip in place I had some protection for the wood. But, I was anxious to see some progress... so I pulled the clip off. C'est L'ive! My patience only last so long, ha. 2. So I think you are absolutely right here. The first rivet that came out easily was drilled all the way through in almost the diameter of the rivet and it came out beautifully. The rivet that is still stuck is pretty much free but compressed in the wood and not moving at all... I have a funky Dremel knock-off and I'll try some grinding with it and then try and drill a 1/16" bit down the side and see if I can loosen it up. 3. I have a bag full of rivets from Mark at Long Haul but the tool would be great. Looked at that site and they're a little too pricey for me. Unless I'm looking at the wrong tool, the price seems to start around $165 without the two dies that are needed. So I think it'll be hammer time. 4. I ordered some clips from Mark $10/ea... a little pricey but it keeps my spares for the AEII in one piece. 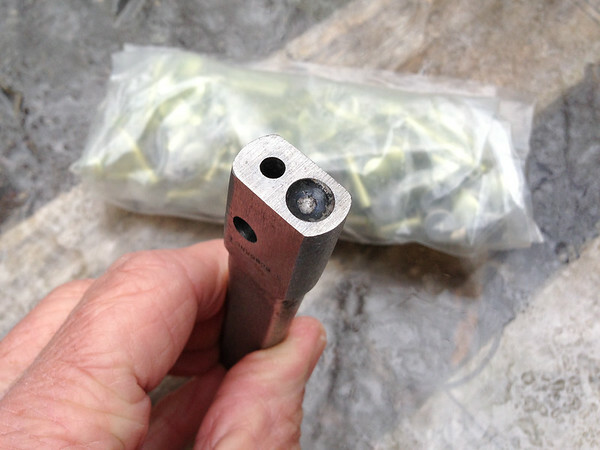 The T9 clip has a spacing on 30mm between hole centers. So I sent that measurement to Long Haul in hopes they have the same size. We'll see. I have three clips to go so hopefully I'll have figured out a good system by the time this is done. I can sympathize with your rivet adventure! Been there, done that both on my AE II and Nautiraid (brass rivets on this one!). If the kayak has been used a fair amount in salt water, driving the rivets out can be an adventure: The rivet shank corrosion causes the rivet to really resist being driven out. Letting a ballpeen hammer "dance" on a punch (a lot of light taps) will tend to vibrate the rivet out. You also need a metal backing plate with a hole for the rivet to be driven through. Light taps are the key, or you just create a new rivet head... I have had to drill out one broken and badly corroded rivet, I used my drill press. Still, tough to keep the drill centered on the rivet. 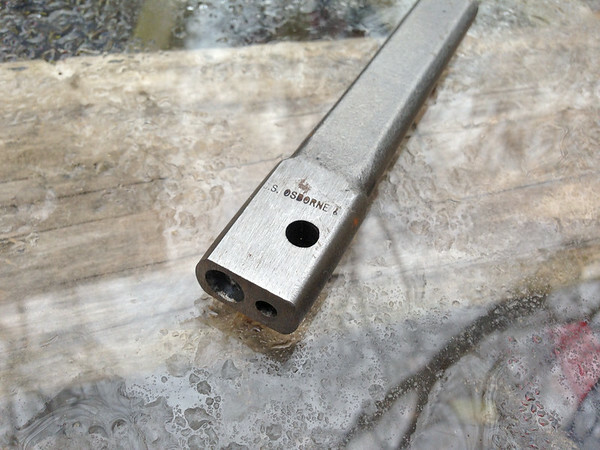 For my "custom" rivet head tool, I grabbed an old bolt and drilled in a dimple on the end with the threads. Works just fine. Hillbilly engineering at its finest. I also like to start the head with a small dimple drilled into the rivet, and form the head while rotating the rivet tool at an angle. I like to limit the force needed to form the head, the danger is that you can buckle the shank of the rivet inside the wood piece. If the shank buckles, you split the wood (been there, done that with a brass rivet...). Salvaging old clips? Maybe, check for wear on both the tongue and the movable clip. A worn clip might not grab the tongue. Last edited by ChrisO on Tue Apr 07, 2015 6:30 pm, edited 1 time in total. I'm planning to do this on my T12 this summer, so I really appreciate you going into so much detail here. I'm making some progress here... but it's been pretty hard won, ha. Hopefully I can make a succinct summary at the end of all this. I've been making lots of pictures of the progress, or lack thereof, and will post them if anyone's interested. Here's a recap of what I'm learning as of today's shade tree work in 41ºF... got downright cold after a couple hours. I'll try and spare you all the colorful details, but I think I've got it figured out for hand-held drill operation. So far all the advice I've gotten is good with the exception of tapping the rivet out. On this boat the rivets haven't tapped out, or even moved by tapping, period. Whether they expand during installation or the wood swells when wet... these things don't move. Drilling holes all the way through the rivets seems to be the way to go. Drill on the side with the clip and use the clip as a backing shield to protect the wood. DO NOT REMOVE THE CLIP until it literally falls off. The clip is actually pretty thick and you can get the majority or all of the rivet head off by drilling through the head down into the clip. I started with a punch making a dent in the top center of the rivet, clip side, and then started drilling with a small bit, 1/16" at about 20 RPM, yes, that slow with a drop of oil. I only had about a 1/4" of the bit exposed and cleaned, extended and oiled it as my hole got deeper. I did increase the speed as I got about 2/3 the way through. Oil seems to be a big player as well as a sharp bit... thanks Greg. The shorter the shank the less chance of breaking the bit. By my calculation, breaking a bit inside the rivet, that you can't get out, extends the job by about 400%. Try and go as straight as possible, increase the drill bit size in smaller increments than you would using a drill press. I alternated back and forth between the two rivets on a clip so they stayed pretty even progress wise. Once the original pilot hole is through the rest goes fairly quickly. Clamp the piece down so you can use both hands on the drill. Don't use a lot of pressure, let the drill do the work. Back off if the bit starts clicking. Make frequent stops to clean and re-oil the bit. Change bits if you get anxious. Patience. Once you get to the 1/8" hole... maybe larger, you can start thinking about taking the head off. Remember DON'T REMOVE THE CLIP. I might even use a narrow vice grip to hold it on a little longer next time. Drill as much of the head off as you can using the biggest bit you can but be careful not to jump too big, you can gouge the hole and find it impossible to get back to center. After drilling the heads off turn the piece over and see how your aim was. Of the two rivets I did today one came out center the other way off to the side. The one on the side pulled right out. The clip came off before I was able to completely remove the head on the rivet with the center hole and a little bit of head was left on the clip side. It wouldn't budge with tapping, and the tapping only bent the remaining piece of head into the wood. I went to the other side of the piece and used a larger bit to open the hole some more and the rivet spun. Aha! I slowly bit down into the rivet again until it stuck. As the rivet slowly began to turn I was able to pull it out with the drill bit. And this is the solution... I'm sure. At least I really hope so. In summary: Drill a reasonable sized thru hole, remove the head from the clip side, remove the rivet with an Easy Out. Done. Regarding a tool to pound the rivets to a proper head: No, you don't need one of those expensive tools for assembly line work. Unless they are no longer offered, I purchased a simple punch-like device with a concave end and a flat top. They come in multiple sizes specific for particular diameters of rivets. I found that they produce excellent heads on the rivets once you figure out exactly what length you need sticking out before you pound it. If too long, the new rivet will bend and not seat properly. If too short, you will not get an adequate head. I would send you mine, but I already loaned it to a friend who has yet to return it. Try calling Jaycee rivets and ask them if they still have these simple hand rivet punches. They give the best results, IMHO. Steve I actually have one of those things! I found it the other day when I was checking the fit of the rivets I have from Mark. I'll make a picture and we can compare notes. Mine has a couple holes that the rivet can fit through along with the cap former... not sure what the holes are for unless maybe for measuring or helping hold the rivet for cutting? Any idea? I'll try and get a picture tomorrow. Kinda looking forward to trying this out. Speaking of checking the rivet fit... my rivets are a little sloppy in the old holes... What do we think about this? Will they spread out when I hammer them down? Sure seems like the original ones did. 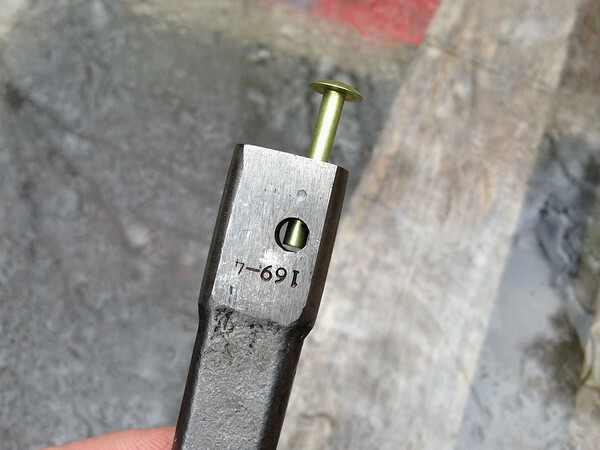 If the rivets are too loose in the hole, you may not get a nice, straight and solid fastening. I think I would try some wood filler or a larger diameter rivet if possible. If the rivet can be kept straight by having the clip at one end and a substantial aluminum washer at the other, you may get away without a filler. The key is to keep the rivet perfectly straight and having the correct length. Also, if both rivet holes are loose, the clip may end up at a slight angle or not lined up perfectly. Steve, excellent point on the alignment... I might have forgotten about that. I'll ask Mark at Long Haul about fillers. I like that idea. Here are some pics of the tool I have. I figure I'll make a test or two before working on the clips. Have you come up with a good measurement for the amount of rivet above the piece? The hole on the end is just about the size of the rivet. The hole on the side is a bit wider. Any ideas what these holes might be for? Did I mention that I have two more clips that I was going to remove because of cracking? Well, the mentioning of JB Weld on Klepper clips by Mark at Long Haul got me thinking I might try that fix before I drill out four more rivets. A run to the hardware store and some judicious toothpick work sounds just a little more entertaining at the moment. Although I am pretty certain the Easy-Out method should be Golden. Chris, I think you could certainly get a rhythm going with these rivets... but if you have more than a few to do I'd seriously consider some simple type of drill press. I'm pretty sure it would make removing the old rivets a lot easier. I read that description again and I get it. The 'Burr' was throwing me off, but that's really just a washer of sorts. Makes sense. Did I mention that I have two more clips that I was going to remove because of cracking? Well, the mentioning of JB Weld on Klepper clips by Mark at Long Haul got me thinking I might try that fix before I drill out four more rivets. A run to the hardware store and some judicious toothpick work sounds just a little more entertaining at the moment. Does anyone know any details about repairing th clips using JB Weld?